The price is per room / night for 2 persons incl. breakfast from the buffet, excl. resort tax. Best price guarantee for direct bookers! Inkl. Wörthersee Plus Card with many reductions in the area. Price per apartment per night for 1 - 2 persons. Children up to 6 years are free. Extra person EUR 20,00 per night. 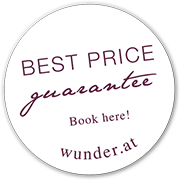 Price reduction up to 7 nights minus EUR 10,00 per apartement per night – valide up to 26.5./ 1.- bis 8.6. / 22. - 29.6. / 24. - 31.8. / ab 22.9.2019 Prices depends on the number of persons and length of stay. Want to relax on the balcony? Unwind like a couch potato? Prepare spaghetti “Wunder-style”? Or rather play a game of Ludo? Our apartments comply with (almost) any wish or requirement: Solid wood furniture, complete with linen and kitchenware, tastefully furnished and as individual as our guests. WITH US YOU´ll SLEEP WELL! For those who like it cozy! We offer a selection of pillow materials for your personalized comfort: cherry pit or herbal pillows (warmed upon request) for side-sleepers and stone pine pillows filled with pine shavings providing heavenly sleep. Have a wonderful rest! Shower, extra toilet, hairdryer, flat screen sat-TV, radio, WLAN access and safe. Kitchenette with sink, double hotplate, refrigerator, Nespresso coffee maker B2B, water kettle, toaster, microwave oven; kitchenware and linen. At your doorstep. Upon request we provide you with freshly baked bread and rolls in the morning. Just let us know the evening before. Cots, highchairs are available for our little guests. Just let us know what your requirements are!